After the overwhelming success of his special release "First Tracks", which was painted to raise funds for the First Night '93 New Years celebration in Winston-Salem, Dempsey Essick was asked to originate a new painting to support First Night '94. Dempsey's challenge was to create a painting which incorporated items from each of the areas in North Carolina where First Night festivities were to take place. He has responded to the challenge with what is perhaps his strongest painting to date. 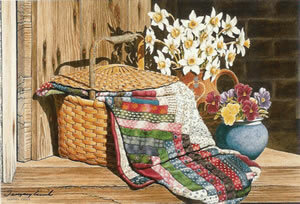 "Carolina Heritage" offers the viewer a sensory feast of color and texture in the best Essick tradition. Using the old boards and handmade brick of the Misch Tobacco Store's smokehouse in Old Salem as his background, Dempsey has brought together a split-reed feather basket from the Charlotte area; a log cabin quilt from Asheville; a classic blue cracked pot from the Raleigh area; and a two-hundred-year-old milk jug from Old Salem. To add to the color contrast he has introduced a bouquet of narcissus and pansies, both of which are historically correct for the Old Salem area. The hallmark of Essick's work is the incredible amount of detail he manages to include within the frame of his paintings. In "Carolina Heritage" the viewer's focus shifts rapidly from the soft folds and intricate print patterns of the quilt to the newly split staves of the basket, then to the pristine white and velvet nap of the flowers. In the time it takes to absorb the almost casual coming together of all the elements of the painting, the viewer's eye finally returns to the basket and its bark covered handle which looks so real there is the temptation to reach out and touch the roughness.